These photos show the B.O.B. Revolution CE (plum pushchair on the left) side by side with the Mountain Buggy Urban Jungle (Runway Edition) (blue pushchair on the right). The children are our 4 years and 6 months old (107cms tall, 91st centile) girl and our 2 year 9 month old (87.5cms, 9th centile) boy. It is clear that the B.O.B. has a much bigger seat and hood clearance. Both pushchairs have big seats and good leg length, although the B.O.B. Revolution CE visibly has the biggest seat. Both pushchairs have big hoods although again the B.O.B. hood is bigger. The Urban Jungle has a flick our visor however it was not particularly useful and looked messy. Both pushchairs have good sized baskets. The Urban Jungle basket is fantastic with various pockets and pouches which are great for knowing exactly where your purse, phone, keys etc. are. The B.O.B. has a mesh pocket on the rear of the seat and also mesh pockets on either side of the seat for drinks and toys. The Mountain Buggy Urban Jungle comes with a bumper bar. The B.O.B. has an optional snack tray option. Both pushchairs have a footbrake. The Urban Jungle footbrake is more difficult to apply and is very difficult to get your foot underneath to flick off again. I have to use my hand because the brake bars are too near the ground. The B.O.B. brake is easy to flick on and off. B.O.B. has a fixed height foam covered handle which is ok for me at 5ft 6ins, but not for the nearly 6ft Mr BB. The Urban Jungle handle is adjustable from high to low, thus will suit people of different heights. The Urban Jungle has a ribbed handle which we find uncomfortable. We always cover Mountain Buggy handles. The Mountain Buggy Urban Jungle is suitable from birth. The B.O.B. is only suitable from 6 months of age. However both pushchairs have carrycot and car seat options. B.O.B. comes with adjustable tracking and adjustable suspension. The front wheel locks forwards for greater stability. The Urban Jungle front wheel will lock underneath the pushchair. B.O.B. has adjustable suspension for children of different weights. We like the pull tight harness toggles on the B.O.B. – See the last photo – It made it much easier to put a wriggly child into the seat and then tighten them up. The Urban Jungle harness is very difficult to alter height wise. The buckle is hard too as it requires two hands to release. Great if you have a Houdini child (although there are two buckles on the shoulders which would allow for a quick escape) but I find these two handed release buckles a pain to use. Both pushchairs have a quick and easy fold although they are quite different. The Urban Jungle has two catches near the footplate. Once released the pushchair folds flat to the ground. The B.O.B. Revolution CE has a 2 stage fold, but its very quick. Use 2 triggers on the handle to fold the top half down. Then grasp the red handle underneath the seat and pull. Both pushchairs have a manual storage lock. The B.O.B. is light and easy to lift and carry. The Urban Jungle is a big chunk to lift and carry, but it can be towed. 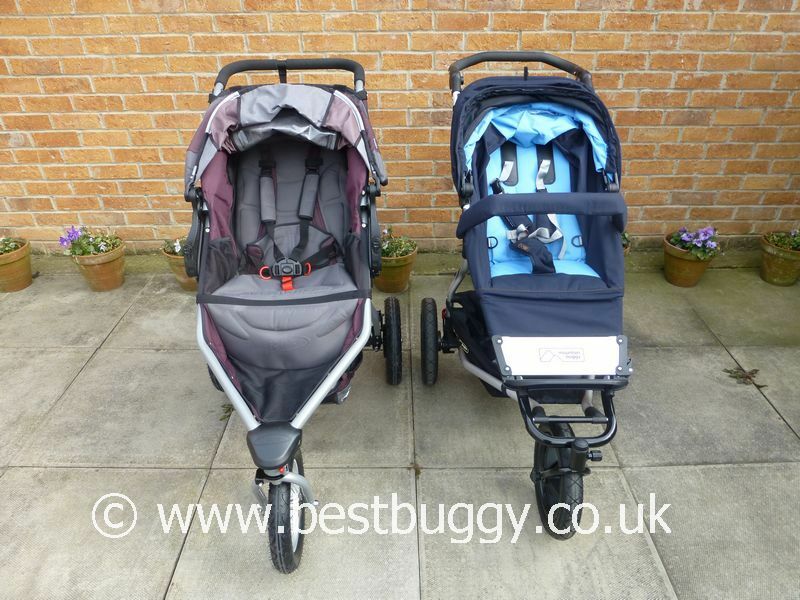 Both of these pushchairs are excellent: easy to use and easy to push.